The US secretary of state appeared to say on CBS News that America has to negotiate with Syria’s president about a political transition in the war-torn country. But later the State Department clarified that John Kerry wasn’t referring to Bashar Assad. "But to get the Assad regime to negotiate, we're going to have to make it clear to him that there is a determination by everybody to seek that political outcome and change his calculation about negotiating,” Kerrysaidon Sunday. Kerry added that the US and some other countries were trying to restart talks on the resolution of the conflict in Syria, which has now entered its fifth year. “Because everybody agrees there is no military solution. There is only a political solution….and I am convinced that with the efforts of our allies and others, there will be increased pressure on Assad,” Kerry said. However, later US State Department spokeswoman Marie Harf said that in his statement Kerry wasn’t referring to the Syrian president. “By necessity, there has always been a need for representatives of the Assad regime to be a part of this process. It has never been and would not be Assad who would negotiate – and the secretary was not saying that today,” she said. Some Western states, particularly the US, have insisted that Assad should step down. 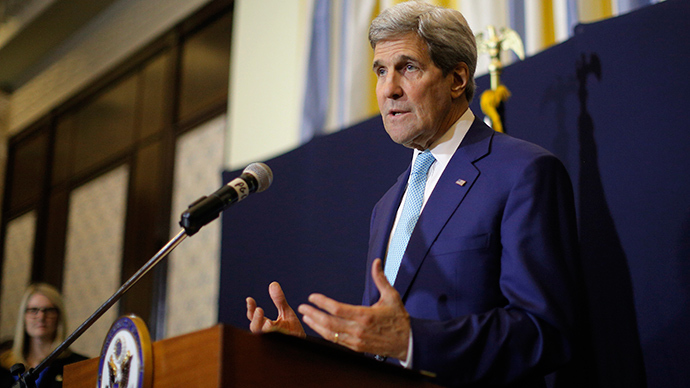 Kerry even said on March 5 that “military pressure” may be needed to oust the Syrian president. Kerry’s statement on Sunday, given in an interview to US media, hints that Washington may be softening its stance towards the Syrian government. Kerry was speaking on the fourth anniversary of the start of the civil war in Syria, which started as peaceful protests against the Assad government, but descended into violence claiming more than 210,000 lives. The US has been supporting the Syrian rebels, who insist that the Syrian president should be ousted. In January, Russia and the US organized the Geneva-2 peace talks between Assad’s government and the Syrian opposition. However, after two rounds of negotiations, no agreement was reached. This April, Moscow is set to host a meeting between the two sides of the conflict. Last September, the US-led coalition started airstrikes in Syria as a part of a joint effort to battle Islamic State militants (formerly known as ISIS, or ISIL), who had seized northern Syria and parts of Iraq. Assad has stressed multiple times that strikes are an illegal intervention because they have not been authorized by a UN Security Council resolution and do not respect the sovereignty of Syria. Assad told French reporters in December that the airstrikes are “merely cosmetic” and “terrorism cannot be destroyed from the air.” He stressed that the Syrian army has been conducting ground operations as well as airstrikes against terrorists which are larger than that those launched by the alliance. “We are the ones fighting the battles against ISIS on the ground, and we haven’t felt any change, particularly that Turkey is still extending direct support to ISIS in those regions,” he said. It would be far easier to address the issue of the Islamic State militants in Syria if the opposition and the government negotiated a ceasefire, UN envoy Staffan de Mistura told RT on March 6. He also said that the Syrian people themselves should decide upon their future and start an internal discussion. He added that the governments, who have “an influence, who have been involved, engaged with the government or with the opposition” should be helping in facilitating the Syrian peace dialogue.